When I was a kid, mushrooms weren’t very widely available in India, like they are now. It was only when I grew up that I begin to see them in the market and also see them being used in recipes. So it wasn’t something that was made frequently in my home. I remember Mushroom Matar (mushroom-green peas curry) was the only thing that was made in our house and that too very rarely. But now I cook them often. Since Sarvesh doesn’t like them, I mostly end up cooking them only for my lunch or dinner. I have always been a big mushroom fan. 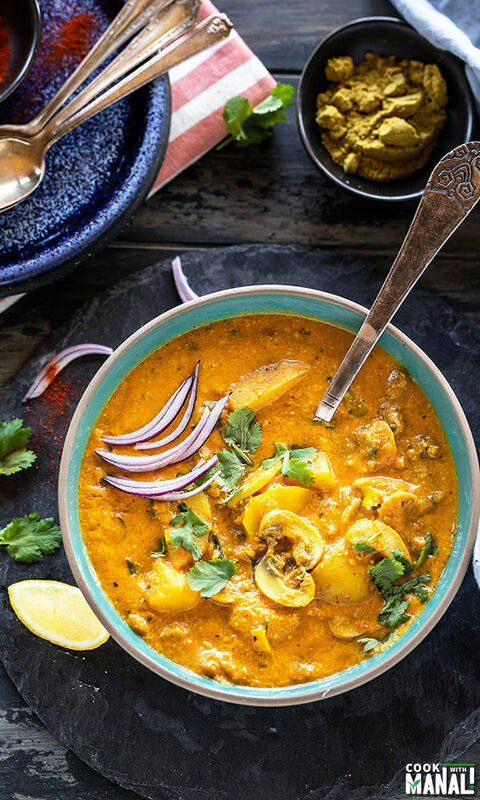 I love them in all forms- as pizza topping, in soups and of course in curries like this Potato Mushroom Curry! I wanted this curry to be little creamy and for that I added some cashew paste to it. The cashew paste makes it really nice and creamy also gives it a nice taste. 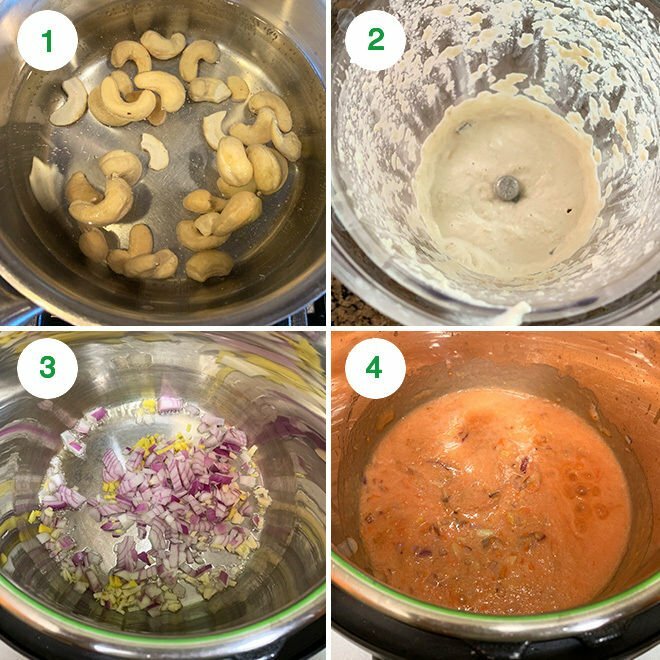 To make the cashew paste, all you have to do is soak some cashews in hot water for 10 to 15 minutes and then blend to a paste. If you don’t have cashews, almond would also work. 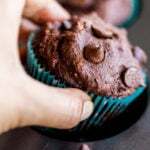 You can also try poppy seeds paste. Coming to the spices, I have added coriander, smoked paprika, garam masala, turmeric and some chili powder. You can adjust spice levels to taste. As usual with my recipes, this curry is mildly spiced. If you are not a fan of potatoes, you can double the mushrooms and skip the potatoes. You can even add green peas to the curry if you like. 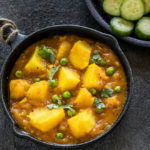 For this aloo mushroom masala recipe, I used my Instant Pot and cooked the curry for 2 minutes on high pressure. I like my mushrooms to have a nice bite to them so 2 minutes was good for me. If you prefer them softer, cook for 4 to 5 minutes. Also remember to chop your potatoes into 1/2 inch to 1 inch pieces. If you chop the potatoes really small, they would turn mush and you don’t want that. 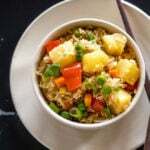 If you don’t have an instant pot or a pressure cooker, you can still make this recipe on a stove top. If making on the stove top, follow all the steps as it until adding the pureed tomatoes. Once you add the pureed tomatoes, add the spices, salt and sugar and cook for 4 to 5 minutes. Then add the chopped potatoes, mix well and cover the pan with a lid and cook for 4-5 minutes stirring often. Add in 3/4-1 cup water (adjust consistency to preference), sliced mushrooms, mix well and cook for another 10 minutes or so (cover pan with a lid) or until the mushrooms and potatoes are both cooked. Once the veggies are cooked, add the cashew paste and let it simmer for 5 minutes. Add in cilantro, kasuri methi and lemon juice and serve. 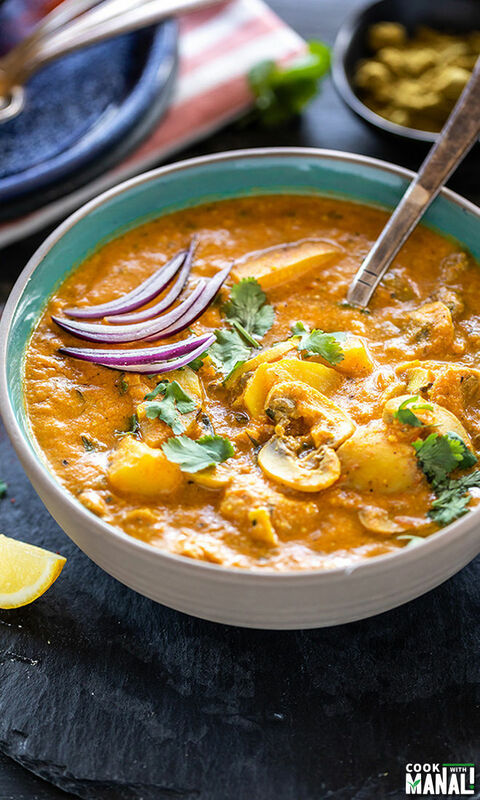 Hope you guys enjoy this one pot aloo mushroom masala recipe! 1- Soak 1/3 cup of cashews in hot water for 10 to 15 minutes. 2- Then puree in a blender to a paste along with 1/4 cup water. Set it aside. 3- Press the saute button on the Instant Pot. Once it displays hot, add the oil and then add the chopped onion, ginger and garlic. Cook for around 3 minutes or until the onions are soft and light golden in color. 4- Add the pureed tomatoes or use a can of crushed tomatoes. Scrape the bottom and deglaze the pot. 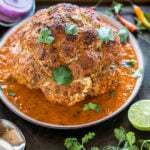 5- Add the all the spices- coriander powder, garam masala, smoked paprika, turmeric and chili powder. Also add the sugar and salt. Stir to combine. 6- Add in the sliced mushrooms and potato. Toss to combine with the masala. Add in 1 cup of water. 7- Close the pot with the lid and press the manual or pressure cook button. Cook on high pressure for 2 mins, with the pressure valve in the sealing position. Open the pot and press the saute button again. Stir in the prepared cashew paste and mix. 8- Add in the kasuri methi and cilantro. Simmer the curry for 2 to 3 minutes, the curry will thicken. Add lemon juice and mix. 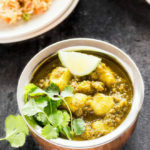 Serve aloo mushroom masala over rice or quinoa! 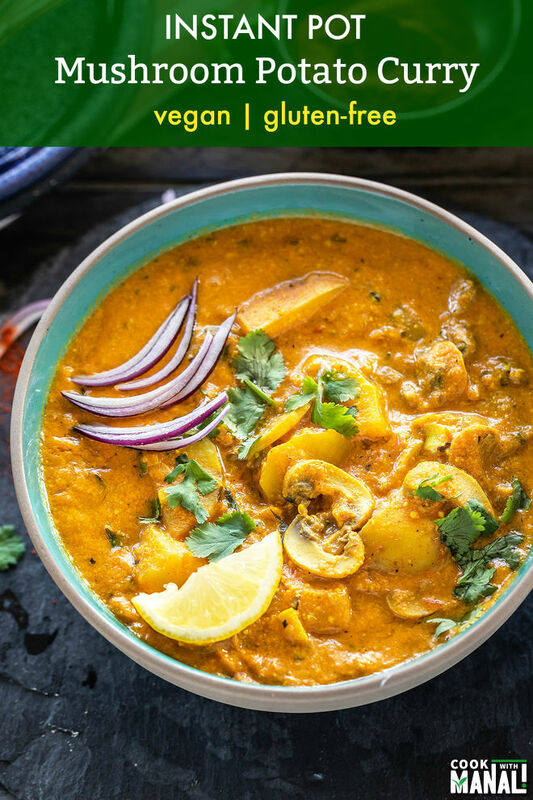 If you’ve tried this Aloo Mushroom Masala Recipe then don’t forget to rate the recipe! 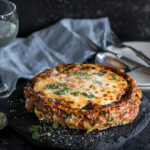 You can also follow me on Facebook, Instagram to see what’s latest in my kitchen! 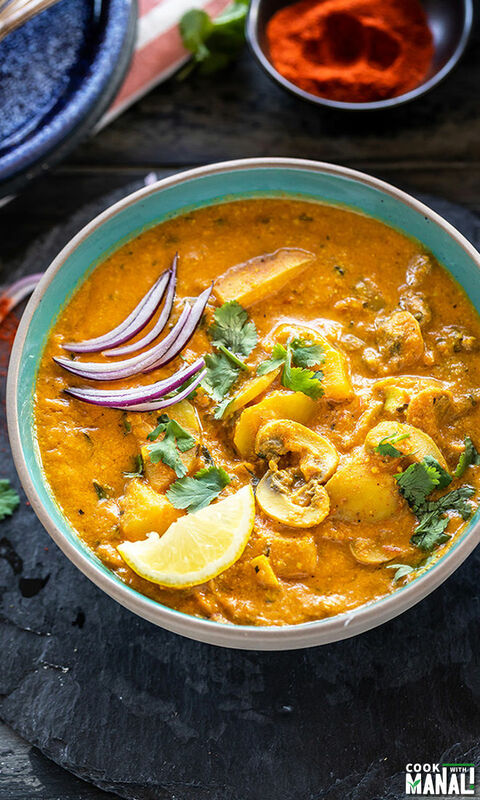 Vegan Instant Pot curry made with potatoes & mushrooms! 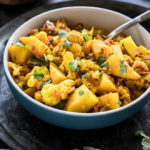 This wonderfully spiced Aloo Mushroom Masala makes a comforting meal and is also gluten-free. Soak 1/3 cup of cashews in hot water for 10 to 15 minutes. Then puree in a blender to a paste along with 1/4 cup water. Set it aside. Press the saute button on the Instant Pot. Once it displays hot, add the oil and then add the chopped onion, ginger and garlic. Cook for around 3 minutes or until the onions are soft and light golden in color. Add the pureed tomatoes or use a can of crushed tomatoes. Scrape the bottom and deglaze the pot. Add the all the spices- coriander powder, garam masala, smoked paprika, turmeric and chili powder. Also add the sugar and salt. Stir to combine. Add in the sliced mushrooms and potato. Toss to combine with the masala. Add in 1 cup of water. Close the pot with the lid and press the manual or pressure cook button. Cook on high pressure for 2 mins, with the pressure valve in the sealing position.Let the pressure release naturally for 2 minutes and then do a quick pressure release. Add in the kasuri methi and cilantro. Simmer the curry for 2 to 3 minutes, the curry will thicken. Add lemon juice and mix. Serve mushroom curry over rice or quinoa! Curry will thicken as it cools down as there are cashews in there. So do add 1 cup water, it might seem like a lot but its not. I cooked on high pressure for 2 minutes because I wanted a bite to my mushrooms. If you want them soft, do 4 to 5 minutes on high pressure. 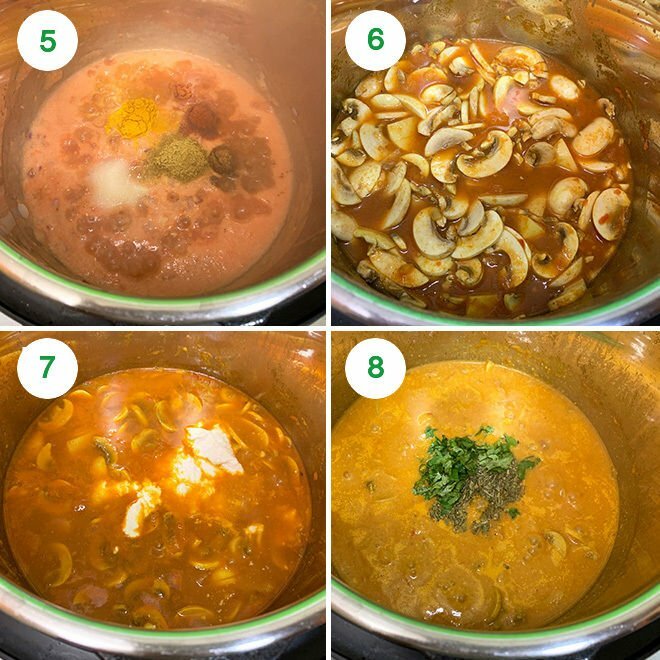 You can follow the same recipe for a traditional pressure cooker. Just cook for 4-5 whistles on high heat and then let the pressure release naturally. Once the veggies are cooked, then add the cashew paste, cilantro, kasuri methi and lemon juice. 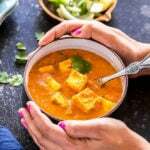 You may also add green peas to this curry. 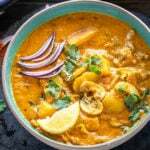 mushroom masala looking too yum with potato combination with spices and gravy it makes the recipes very good taste…i will try coming weekend.